I’ve pretty much fallen out with the MMORPG genre. There’s a few reasons for this but the primary one is that they all start feeling a bit carbon copy after a while. There’s a basic formula that exists in many if not all MMORPGs regardless of their setting or style. Build character, run tutorial, find quest givers, mine or make stuff, add infinitum. I know that’s a really basic way of looking at it but that’s pretty much your bare bones. There’s only so many of a creature you can kill or so many dungeons you realise you can’t do because you don’t have an army of friends before they all start to blur a bit. I’m seeing what might be a break in the norm with this interesting little game called The Galaxy of Lemuria. 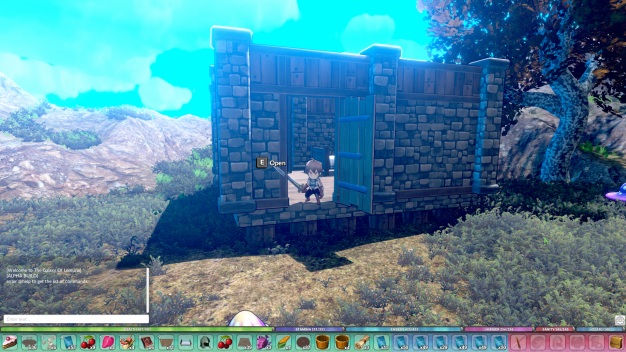 This first thing that drew my attention to this survival RPG is its roguelike nature. In The Galaxy of Lemuria, the planet on which you begin is procedurally generated. This means that there may or may not be other players already there making their own attempt at surviving. Importantly this isn’t just something that’s generated at the start of the game. Each time you begin anew you will find yourself somewhere unexplored and different. This is brilliant for keeping the game fresh and appealing. Don’t just expect to be given one map to explore; you’re part of a galaxy of worlds so there’s plenty of adventure to be had. Speaking of exploration … you will need to gather resources in much the same way as you do in many other games of this genre. Not all of these required items can be found on the planet you’re on; going off-world will more than likely be necessary. You have the A1 Explorer, your own customisable spaceship at your disposal for your journeys among the stars. The other really interesting things about The Galaxy of Lemuria are the way skills and abilities work. 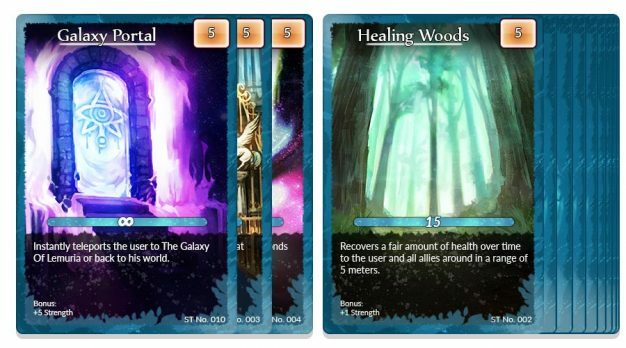 Instead of pumping points into a skill tree you are given a choice between several decks of cards. These cards represent your skills and abilities. 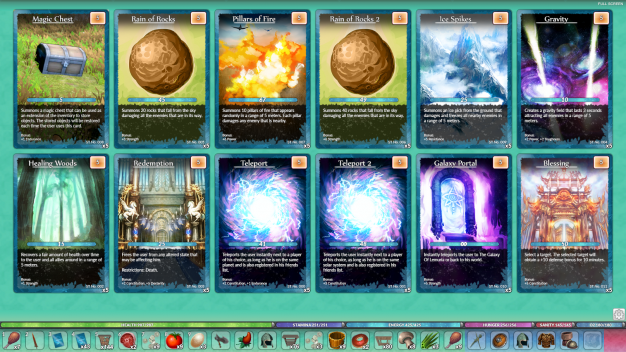 Your character’s starting stats will pertain to the chosen deck but as you progress you can find and collect cards. These are also a tradable commodity within the game. There is also a reward system present within this title that will grant booster packs teeming with new powers and abilities when certain criteria are met. In an interesting twist these cards can only be used so many times in one lifespan. When a player dies and returns to their home hub these cards are restored for future use. Many online RPGs give you the ability to have a pet. This is no different in The Galaxy of Lemuria. 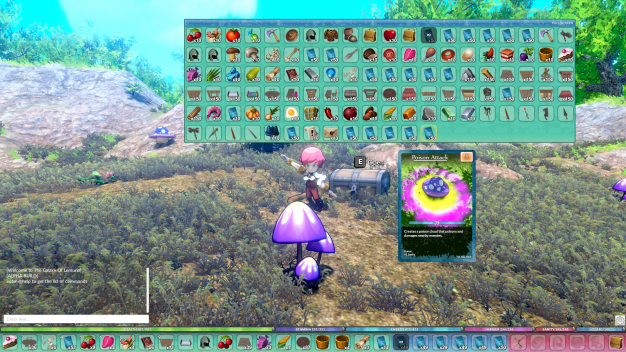 What is different, however, is that these aren’t just pretty ornaments; they have needs including food and HP regeneration. Another important point to make about pets is that these aren’t just things you buy. Your pet starts out as one of the monsters you will face on your journey. You will have to use your character’s persuasion skills to get the target creature on board. If you keep your pet happy and loyal they’ll be there fighting by your side when you need them. As your pets come as monster cards you can also apply them to your weapons instead of adopting them to give them extra abilities. Something that really stinks when you’re doing well in a game such as this is that you’ll lose your favourite items when you die. To take some of the sting out of this experience you have trancendental items. You are able to enchant some of your favourite gear so that it will carry over with you to your next play-through when you die. This ability has its limitations and only one item can be made trancendental per run but this all certainly helps. 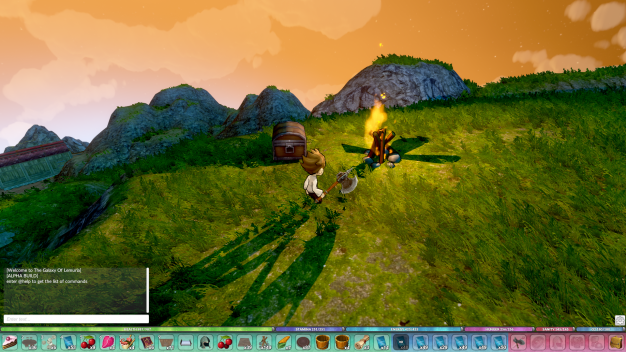 This isn’t just a game where you move around in a purely nomadic fashion. You can build your own base on your home planet with materials you’ve been collecting. You have to be wary. When you’re away doing your thing other players can come along and ruin all your hard work in your absence. On the other hand, make some friends and work together, and you might end up with your own little shared palace. Making friends and influencing people is probably a good idea. You have to be on your toes. Your planet can lose power and be plunged into darkness. You don’t want to be alone when this happens as the biggest and meanest monsters will be roaming the night looking for you. Stay and protect your home or get off planet sharpish, the choice will be yours. If you happen to be finding all this interesting, The Galaxy of Lemuria launched on Indiegogo this past Wednesday. Assuming the game gets the funding it’s looking for, release is planned for next year on Windows, Mac, PS4 and Xbox One. If you want to learn more and maybe get involved you can find more details over at the pre-launch page here. To quote a pertinent phrase, “A change is as good as a rest.” This genre has been needing a good shake for a while. Maybe The Galaxy of Lemuria will be just the game to do it.